First off...big thanks to Pop In Stereo for alerting me to this news! Katie Melua, one of my favorite English artists, is set to release her fifth album, Secret Symphony, on November 14th on her longtime label, Dramatico Records. The album, recorded at London's Air Studios sees the 26 year old Melua reverting back to some old habits, and by "habits" I mean the best kind of habits. In particular I'm referring to her longstanding, on and off again collaboration with composer and conductor Mike Batt who served as producer on her first 3 albums, including her #1 debut album Call Of The Search. Secret Symphony also marks a return to the musical style Melua's fans worldwide have come to know and love, that beautiful mix of blues, jazz, folk and pop that we heard in albums 1-3. One of the first songs to surface from the new album is her cover of "Gold In Them Hills," originally sung by Canadian singer/songwriter Ron Sexsmith on his 2002 album Cobblestone Runway, the song appeared in two forms - an original edit and a version featuring Chris Martin from the band Coldplay. "Gold In Them Hills" was recorded especially for the German compilation series Kuschelrock, in the midst of celebrating their 25th anniversary this year. Melua's song is featured in a trailer for the Kuschelrock 25 compilation which is due for release September 23rd. Watch the trailer below and listen to Katie's beautifully sung rendition of "Gold In Them Hills." While part of me is excited to have Melua back on the musical stage, I'm a little bit disappointed that she's so quickly going back to her beautiful, albeit sleepy style of pop/jazz. Don't get me wrong, I absolutely think the world of Melua and her talents both as a singer and as a songwriter, but I can't help but feel a little like I've been teased. Being such a fan of electronica and William Orbit in particular, seeing her test that genre out, then seeing her revert back to that safe place is a bit disappointing. In many ways, The House was the most commercially viable album of Melua's career, in that electro pop is HUGE right now all over the world. I think the problem that no one associated Katie Melua with electro pop, not even her fan base, which ultimately lead to the album not being as successful as it's predecessors. Just because a musical style is HOT right now, not every artist is suited to that style. For Katie Melua, "commercially viable" just seems to be her brand of pop/jazz and that's OK. I guess I would just have liked to see a little bit more experimentation on the new album. Oh well, perhaps DJs will take notice and give some of her tracks the remix treatment. I'm still rockin' out to remixes of "The Flood" and "A Happy Place" today. Another reason for the album's diminished success of The House was likely the fact that she was hospitalized for six weeks after suffering a break down, and sheer exhaustion. Melua admitted to working herself into the ground and not taking enough time for herself. While Melua did resume promotional activities in 2011, including a European tour (where the girl sells out arenas!) no more singles were released following "To Kill You With A Kiss." As happy as I was to see Melua make it over to the U.S. in August for the album's stateside release, I was disappointed that she didn't come back for a tour. I've now had the privilege of seeing Melua perform live twice and it remains one of my most favorite live performances. In addition to working on her new album, Katie has been keeping busy with causes near and dear to her heart, most recently accompanying members of Project Earth's expedition to the Canadian Arctic where she learned about the preservation of local species and to see just how damaging human beings have been and continue to be to one of earth's fragile ecosystems. No word yet on a U.S. release for Secret Symphony but could probably assume that it's imminent, given that her other albums are available here. UK fans can snag Secret Symphony when it's released on November 14th. Stay tuned for news about the album's tracklisting and first single. So glad to have Katie Melua back doing what she does best. Check out Katie Melua's discography on U.S. iTunes HERE. I love MIKA. I have since he released his first album, Life In Cartoon Motion, back in 2007 and the fact that his brand of infectious, feel good pop has yet to catch on here in America is an absolute travesty. 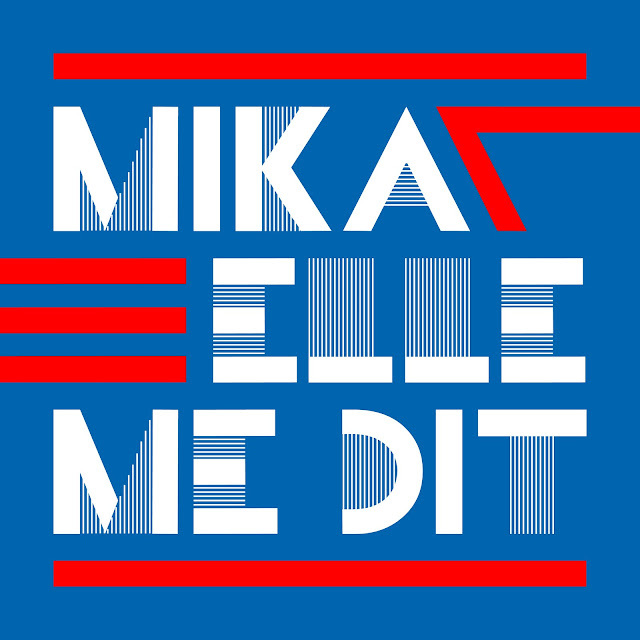 MIKA's latest single, "Elle Me Dit," was released in France July 11th on iTunes via Barclay/Casablanca Records. Co-produced by MIKA and his frequent collaborator, Canadian producer Greg Wells (Katy Perry, Adele), "Elle Me Dit," (meaning "She Tells Me" in English) is an up-tempo, giddy good time, along the very same lines as previous MIKA singles, "Grace Kelly," "Love Today," and "We Are Golden." As of now, the single has only been released in France, Belgium, Canada, Slovakia and Switzerland, becoming a #1 hit in Belgium and peaking at #3 in France. Check out the adorable and fun video clip for "Elle Me Dit" below and look for well known French actress Fanny Ardant, who appears throughout as a kooky matriarch of some sort. Reflecting back on MIKA's entire discography, I can't think of a single...well, single that HASN'T been up tempo and fun. MIKA first grabbed the world's attention with his single "Relax, Take It Easy," a song which was released twice in the UK. Upon it's first release back in 2006 the song became MIKA's first French #1, debuting in the UK at an unfortunate #78. When the song was re-released the following year it charted in the #18 spot on the UK Singles chart. MIKA's follow up single, "Grace Kelly" (one of my favs) became his first UK #1, peaking in France at a measly #82. His debut album, Life In Cartoon Motion, managed to spit out 6 singles (7 if you count the "Relax" re-release) which is pretty impressive for a debut album especially when you consider that four of those six singles were top 10 hits in the UK ("Grace Kelly" = #1; "Love Today" = #6; "Big Girl (You Are Beautiful)" = #9; "Happy Ending" = #7). MIKA followed up his debut album with The Boy Who Knew Too Much in 2009. Not nearly as successful as it's predecessor, the album only spawned one top 5 UK hit, the album's first single, "We Are Golden," which peaked at #4 on the UK chart. Follow up singles "Blame It On The Girls" and "Rain" didn't even crack the top 50, although "Rain" was a top 5 hit in France. While MIKA's album's have sold modestly well for an import artist (his debut peaked at #29 on the Billboard 200, while his follow up peaked at #19) his singles have performed poorly. I keep hoping America will figure out what they've been missing with MIKA but I'm starting to lose hope. With MIKA's new single only available in French speaking countries, and given that the talented 27 year old British/Lebanese singer/songwriter has said in interviews that the album will feature a number of French language tracks, I'm nervous that MIKA is focusing his efforts on Europe and bypassing America. With his new album, The Origin Of Love, scheduled to come out sometime next year, I'm hoping he releases an English language single just to balance things out. While he has done well in France with past releases, his international success isn't anything to brush off and his potential for superstardom is still huge in my opinion. I'm still kicking myself for not seeing him live in Boston when I had the chance. Now I fear that I've missed my opportunity altogether. Check out the "Elle Me Dit" video below and download the single on Canadian iTunes HERE.